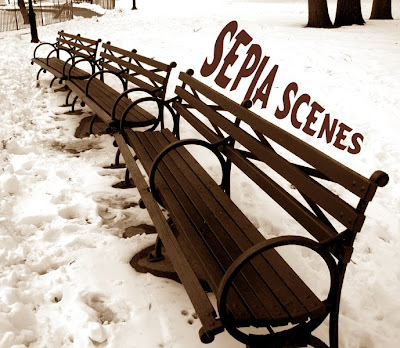 Welcome to Sepia Scenes this week! We have a new badge which you see above. Feel free to copy it and use it in your post. 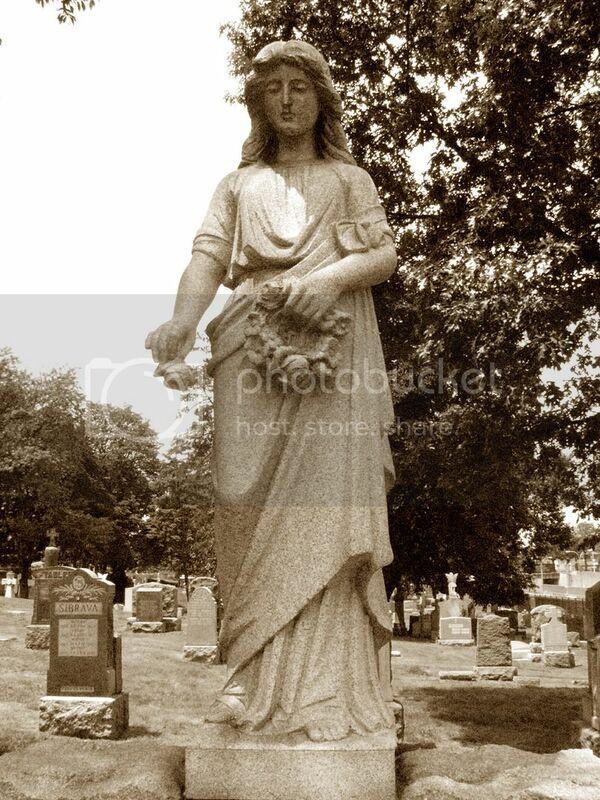 My post consists of two photos from St. Michael's Cemetery in Astoria, Queens, NY. A young woman dressed in draped roman garb is about to drop a rose from her wreath on the grave. Here's a close-up of her hand and the rose. I added some soft focus around the edges of the shot and some graduated tinting. You can get both effects using Adobe Photoshop, Picasa, or other photo-editing software. 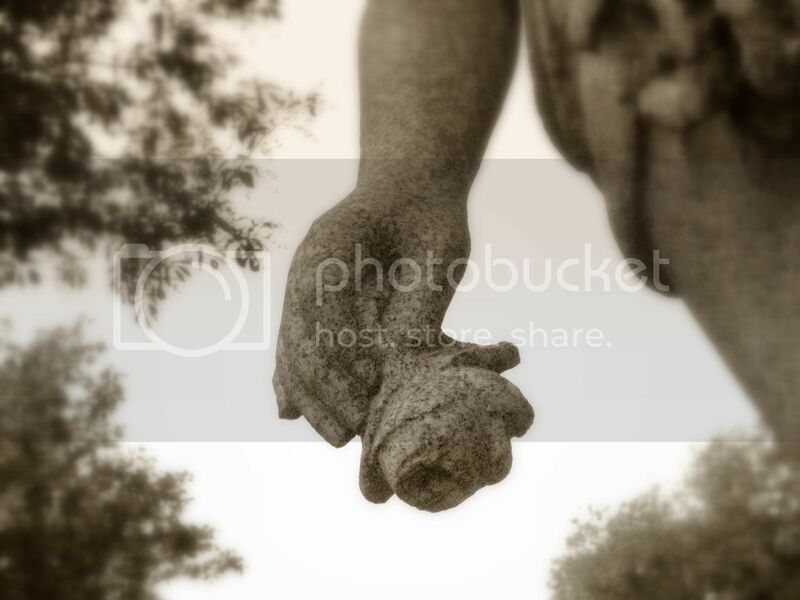 I think cemetery statuary lends itself particularly to a sepia tone, don't you? Mr. Linky is up for you to sign in. Leave a comment if you like but make sure you try to visit your fellow Sepia Scenes participants. I agree cemetery statuary works well in sepia tones. Happy Sepia Scenes and Happy 2010! happy new year Mary! hugs! This is a lovely statue, the look of continuing love. Sepia as always enhances her form, we see the loving and kind act so well here. Happy New Year, Mary! Beautiful statue! She looks lovely in sepia and I like soft focus around the edges. Beautiful traditional icon from a cemetary. I visited our local one recently for the first time and was disappointed by the lack of statuary. Hi Mary! The sepia tones are very suitable on statuary of this kind. Like it very much and A Happy New Year. Yes, I do think cemetery statuary looks great in sepia! Yes Mary. The statue looks great in sepia tones -- headstones too. Nice job both photos. I love the closeup of her hand. What a beautiful statue. You have inspired me to get to a cemetery nearby and get some photos of my own. I like your sepia shot. She's beautiful! Mine is posted. Have a safe and happy new year!